Kim Kardashian looked absolutely stunning in her Colour blocking Gucci Front Knot dress which she teamed with the Gucci green suede and glossed python sandals from the S/S11 collection. I attended Kim Kardashian launch for her new self titled fragrance at Debenhams, Oxford Street this morning where she made a personal appearance to celebrate the launch of her fragrance. I was amongst many other fans; whom some had started queuing from 4am. I reached Oxford Street and joined the queue at 7.30am and happily waited till 9.30am for store doors to open in order to purchase a bottle of the starlets debut fragrance. It was originally stated that the first 150 people to purchase the perfume would get the chance to receive a vip pass, meet, greet and have pics taken with her. 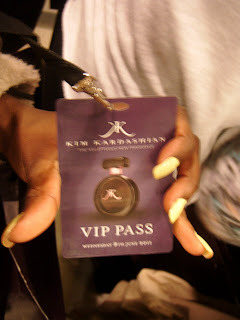 Yet Debenhams gave out 50 extra Vip passes. As time went on the queue got longer and crowds of people started to form. The atmosphere was electric, screaming fans, film/camera crews had arrived and were interviewing fans and taking pictures. 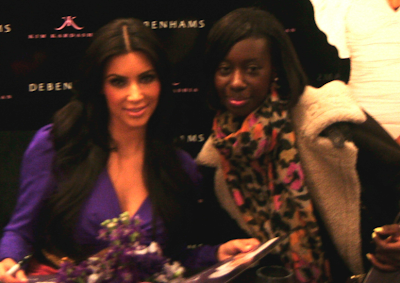 Also ladies dressed in purple dresses were at hand to give a tester of the fragrance. The fragrance is described as a beautiful blend of feminine and sensual notes including mandarin, honeysuckle and orange mixed with pink jasmine, gardenia, tonka bean, musk and sandalwood. 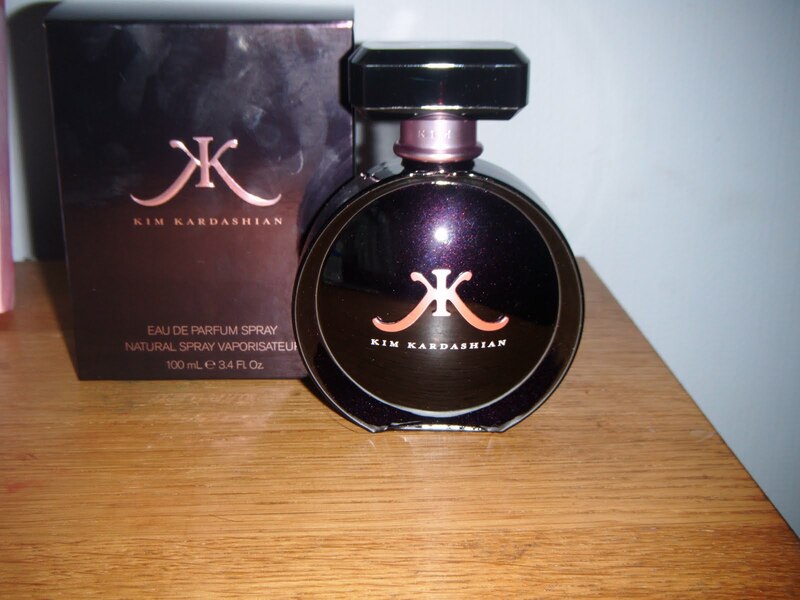 Kim Kardashian fragrance is exclusive to Debenhams until 4th July, after which the fragrance will be available nationwide. 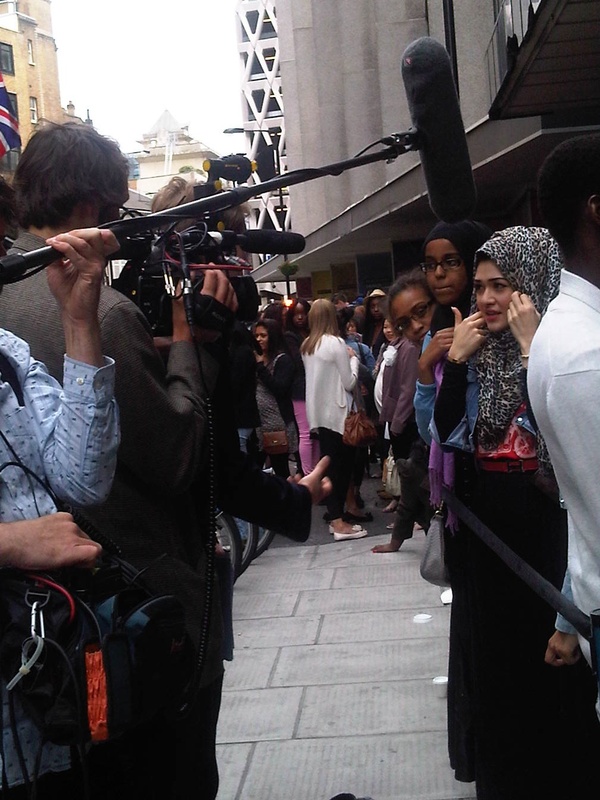 Did any of you head down to Oxford Street for the Launch and how was it for you??? Yeh i did wait for a while. But time funnily enough went along quickly and it was worth it in the end! !